In the first game played in the newly constructed football stadium, the Mount Hope High School "Mustangs" football team lost 32 to 0 to the Greenbrier Military School's "Cadets." The game, played on Saturday evening, was Mount Hope's homecoming game. When coal mining boomed during the early 1900s, banks sprang up in several of the smaller towns in Fayette County, offering banking services to the local mining companies and their employees. 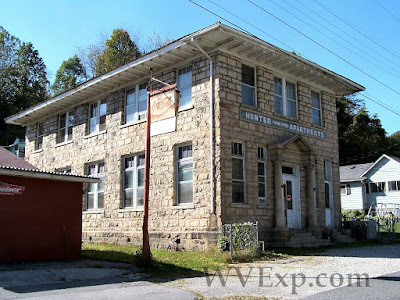 Located in Pax, WV, the Bank of Pax operated from October 1, 1915 until September 4, 1931. Dr. A, L. Hunter was the bank's president and Otis Lively its vice-president. In 1921, the Bank of Pax moved into a handsome new building in town constructed of native sandstone, shown in the photo below. The Bank of Pax was one of several West Virginia banks closed during The Great Depression. Following the bank's closure, the Fayette County Board of Education used the building as a school house for a while. Year later, the building briefly served as city hall. It was payday at the Eccles mine and an ambitious insurance salesman had been permitted to go inside the mines to sell new life and accident policies to workers and collect payments. The agent had managed to sign several miners up for coverage before a violent explosion tore through the workings of the Eccles No. 5 mine, at about 2:30 p.m.
Freeman Linville, an agent of the Providence Life and Accident Company of Charleston, W.Va., was the first victim to be found by the rescuers. At the young age of 32, he had achieved the dubious distinction of being "the only known non-miner to die in a West Virginia mine." For decades, various local history buffs and even some National Park Service (NPS) personnel have recited accounts which usually go something like this: "When a smallpox epidemic swept through the towns of the New River Gorge during the 1890s, health officials decided the unoccupied Red Ash Island was the perfect location for a quarantine camp." While such claims seem somewhat believable at first glance, they don't seem to stand up to scrutiny very well. There is much evidence that the "pest house" in question was not located on Red Ash Island. Instead, the evidence points to a location near the mouth of Ephraim Creek, on the opposite side of New River across from the so-called "island." Photo credit: U.S. Geological Survey, Department of the Interior/U. S. Geological Survey.